A stunning centrepiece of lavender-blue certificated tanzanite is teamed with dazzling diamonds and set in elegant 18 ctwhite gold. A beautifully designed ring for a fresh and vibrant look. 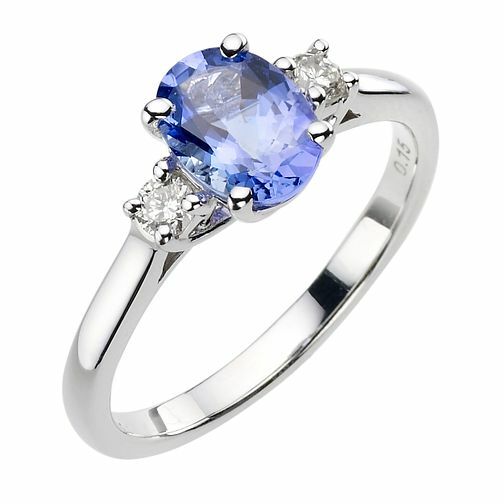 18ct white gold certificated tanzanite and diamond ring is rated 3.0 out of 5 by 1. Rated 3 out of 5 by Anonymous from Disappointed A stunning ring which I purchased a few months ago, very disappointed as the yellow gold comes through the white gold after wearing a couple of months. It has been re-coated again and now after a few weeks the yellow gold is coming through again, very disappointed in the white gold ring, but the tanzanite and diamonds are lovely. Wish I hadn't purchased this ring now after all it isn't a cheap ring for me.